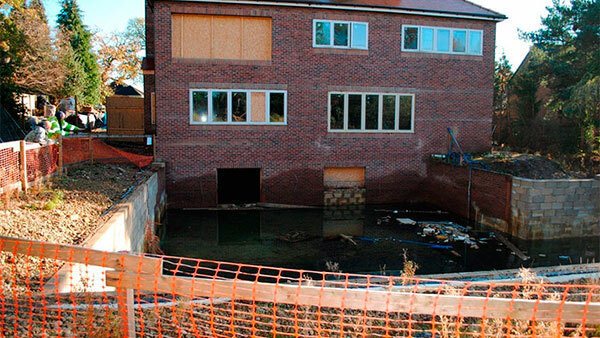 What are the more common problems with basement conversions? Walls and floors below external ground level and the junctions between them should be provided with a waterproofing system. This is to prevent ground moisture reaching the internal surface of the wall or upper surface of the floor, to maintain satisfactory environmental conditions within the basement for the intended use. Consideration should be given also to determining the position of the water table; whether it is high, low or varies significantly throughout the year. There are several different ways in which basement walls and floors can be waterproofed. Whatever method is used, it should be appropriate for resisting ground water pressure and should have British Board of Agreement (BBA) or similar independent technical accreditation. One should bear in mind that good attention to detail and good workmanship are important for the tanking to be successful. The existing walls may have to be underpinned and floor level reduced in order to achieve a satisfactory floor to ceiling height. Existing first floor joists may also have to be supported, such as by a steel beam or beams. It is therefore advisable to seek guidance from a suitably qualified Structural Engineer to undertake the structural design of any underpinning and structural alterations, including drawing up a method statement setting out how and in what sequence the proposed works are to be carried out. It is necessary that the works are designed with safety in mind and carried out in a safe manner and workmanlike manner. Reference may be to Approved Document A of the Building Regulations, which makes recommendations for structural elements. In dwellings, basements will usually have a single stairway. In the event of a fire the stairway maybe blocked by smoke from the basement or ground floor storey. If the basement is to be used for habitable purposes, an external door or window suitable for egress should be provided. Alternatively, a protected stairway leading from the basement to a final exit may be provided. Means of escape provisions for workplaces are more stringent than those necessary for domestic use and a suitable alternative means of escape is normally required. Windows provided for emergency egress purposes should have an openable area of not less than 0.33m2 and at they should be at least 450mm high and 450 wide. A self-closing fire door (FD30) should be provided between the basement and the rest of the house. Mains powered interlinked smoke detectors should also be provided in the basement, ground floor hallway and first floor landing. If the door from a single basement room opens into a room on the ground floor, for example a kitchen, there should be two fire doors at the top of the stair leading in opposite directions. The exit route should be protected by a fire resisting construction. If the house has 3 storeys before converting the basement, self-closing fire doors are required to the basement and to the other rooms which open onto the stairs at all levels. Mains operated and interlinked smoke detectors should be provided at all levels. Any services of more than 40mm in diameter which pass through an element providing fire separation, should have the same fire resistance as the fire-resisting compartment it penetrates. Works to basements that may be used as a workplace require consultation with the Local Fire Brigade.